Item #GSJ-2414: 18Kt. Yellow Gold pendant enhancer with 5x11mm kite shape Sugilite of 1.83 cts. and 25x46mm kite shape Intarsia by Jim Kaufmann. Sugilite with Fire Agate, Australian Opal and Malachite. Item #IGM-INT-40: Sterling Silver pendant with Black Agate and Nature's Paintbrush Intarsia in various shapes and sizes. Item #GSJ-2667-MM: 14Kt. Yellow Gold brooch with 15x16.3mm triangular Fire Agate cab of 8.68 Cts. Item #JR-100 (MML): 14Kt. Yellow Gold pendant enhancer with 13x15.5mm triangular Fire Agate cab of 6.71 Cts. Item GSJ-2742: 14Kt. Yellow Gold Pendant with 12.1x13.5mm pear shape bezel set Fire Agate Cab of 6.82 cts. 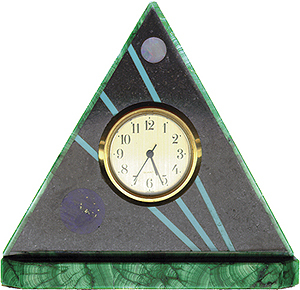 Item #A2PC: 4"x1¼"x3¾" tall Handmade Intarsia Clock by Jim Kaufmann. Malachite, Lapis Lazuli, Turquoise, Opal, and Black Granite with Japanese Quartz movement. 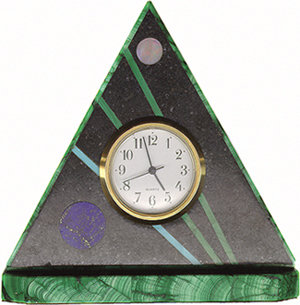 Item #A4PC: 4"x1¼"x4" tall, Handmade Intarsia Clock by Jim Kaufmann. Malachite, Lapis Lazuli, Turquoise, Opal and Black Granite with Japanese Quartz movement. Item #N-20-570: 18Kt. Yellow Gold Brooch with six prong set Round Diamonds of .45 cts. TW and one bezel set 24x35mm Triangle Intarsia by Jim Kaufmann. Sugilite with Australian Opal and Turquoise. 19.76 cts. TW. Item #GSJ-2428: 18Kt. Yellow Gold brooch with 8.5x15.5mm oval Fire Agate cab of 5.51 Cts. and 32.5x33mm triangle Intarsia by Jim Kaufmann. Malachite with Fire Agate, Australian Opal, Pristine and Sugilite. 31.65 cts. TW. Item #JR-21: 18Kt. Yellow Gold brooch with two 5x7mm oval Australian Opals of .89 cts. TW and 25x49mm modified hexagon Sugilite & Opal Intarsia by Jim Kaufmann. Item #LM-87: 3.4"x2.3"x1.5" tall, Intarsia Box by Jim Kaufmann. Lapis Lazuli with Australian Opal, Malachite, Pristine and Black Onyx with Black Granite interior. 14Kt. Yellow Gold hinge and stop. Item #T13: 62x63mm octagon, Intarsia by Jim Kaufmann. Malachite with Australian Opal, Sugilite, Turquoise and Black Jade. 272.20 cts. TW. Item #6E9: 17.3x20mm rectangle, Intarsia by Jim Kaufmann. Pristine with Australian Opal, Lapis Lazuli and Black Jade. 12.89 cts. TW. Item #5B4: 37.5x37.5mm square, Intarsia by Jim Kaufmann. Black Onyx with Australian Opal, Sugilite, Malachite and Pristine. 38.79 cts. TW. Item #0J6: 45x49.5mm rectangle, Intarsia by Jim Kaufmann. Picture Jasper with Black Onyx, Black Jade, Red Jasper and Wild Horse Canyon Jasper on Black Granite Backing. 140.07 cts. TW. Item #1D6: 31x39.5mm rectangle, Intarsia by Jim Kaufmann. Biggs Jasper with Bruno Pink Jasper, Pristine and Black Jade with Granite backing. 80.32 cts. TW. Item #0E1: 34x46mm rectangle, Intarsia by Jim Kaufmann. Morrisonite with Red Jasper, Pristine, Black Onyx, Tan Jasper and Black Jade on Granite backing. 95.64 cts. TW. Item #4B1: 30.5x43.5mm rectangle, Intarsia by Jim Kaufmann. White Dendritic Agate with Black Onyx, Pristine and Tan Jasper on Granite backing. 67.32 cts. TW. Item #9D2: 29.5x40.5mm rectangle, Intarsia by Jim Kaufmann. Biggs Jasper with Red Jasper, Pristine, Black Onyx and Tan Jasper on Granite backing. 81.40 cts. TW. Item #3D7: 28.5x43.5mm rectangle, Intarsia by Jim Kaufmann. White Dendritic Agate with Wild Horse Canyon Jasper, Black Onyx, Pristine and Black Jade on Granite backing. 65.45 cts. TW. Item #6D6: 37x42mm rectangle, Intarsia by Jim Kaufmann. Wild Horse Canyon Jasper with Black Onyx and Tan Jasper with Granite backing. 108.52 cts. TW. 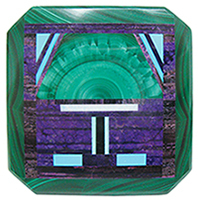 Item #SM131: 3.6"x5.1"x1.6" tall, octagon Intarsia Jewelry Box by Jim Kaufmann. Sugilite with Malachite, Azurite-Malachite, Pristine, Lapis Lazuli and Black Jade. Black Granite interior and 14Kt. Yellow Gold stop and hinge. Item #LM107: 2.8"x4.1"x1.75" tall, Octagon Intarsia Jewelry Box by Jim Kaufmann. Lapis Lazuli, Malachite, Australian Opal, Pristine and Black Jade. Black Granite interior. 14Kt. Yellow Gold hinge and stop. Item #LM82: 2.625"x3.25"x1.5" tall, Rectangle Intarsia Jewelry Box by Jim Kaufmann. Lapis Lazuli with Malachite, Australian Opal, Black Jade and Pristine. Black Granite interior. 14Kt. Yellow Gold hinge and stop. Item #SM85: 2.312"x3.438"x1.5" tall, Rectangle Intarsia Jewelry Box by Jim Kaufmann. Sugilite with Malachite, Pristine and Black Onyx. Black Granite interior. 14Kt. Yellow Gold hinge and stop. Item #AM584: 3 1/4"x2 9/16"x1 7/16" tall, Rectangle Intarsia Jewelry Box by Jim Kaufmann. Mallacite with Sugilite, Azurite, Black Jade, Pristine and Lapis with Black Granite interior;14Kt. Yellow Gold hinge and stop. Item #Y77: 14Kt. Yellow Gold Pendant Enhancer with bezel set 42x43.5mm triangle Intarsia by Jim Kaufmann. Malachite with Fire Agate, Australian Opal, Sugilite, Black Jade and Pristine. 47.14 cts. TW. Item #V37: 14Kt. Yellow Gold pendant enhancer with 19.2x46mm modified hexagon Intarsia by Jim Kaufmann. Lapis Lazuli with Australian Opal, Black Jade, Pristine and Turquoise. 32.88 cts. TW. Item #6K9: 14Kt. Yellow Gold pendant enhancer with 21.5x37.5mm modified hexagon Intarsia by Jim Kaufmann. Lapis Lazuli with Fire Agate, Sugilite, Australian Opal, Turquoise and Malachite. 21.70 cts. TW. Item #V71: 14Kt. Yellow Gold Pendant Enhancer with bezel set 21.1x39mm Hexagon Intarsia by Jim Kaufmann. Sugilite with Australian Opal, Turquoise and Black Jade. 27.94 cts. TW. Item #T08: 14Kt. Yellow Gold Pendant Enhancer with bezel set 28x39mm Intarsia by Jim Kaufmann. Malachite with Australian Opal and Lapis Lazuli. 45.41 cts. TW. Item #X41: 14Kt. Yellow Gold Pendant Enhancer with 21.9x45.5mm modified hexagon Intarsia by Jim Kaufmann. Malachite with Australian Opal, Sugilite, Azurite-Malachite and Pristine. 48.26 cts. TW. Item #R93: 14Kt. Yellow Gold Pendant Enhancer with bezel set 31x39mm heptagon Intarsia by Jim Kaufmann. Sugilite with Australian Opal, Turquoise, Azurite-Malachite and Black Jade. 67.97 cts. TW. Item #V06: 14Kt. Yellow Gold pendant enhancer with 23x46mm modified hexagon Intarsia by Jim Kaufmann. Lapis Lazuli with Australian Opal and Malachite. 38.20 cts. TW. Item #9B9: 14Kt. Yellow Gold pendant enhancer with 37x47mm kite Intarsia by Jim Kaufmann. Malachite with Australian Opal, Sugilite, Azurite-Malachite and Pristine. 59.49 cts. TW. Item #Q99: 14Kt. Yellow Gold Pendant Enhancer with bezel set 25x40mm kite Intarsia by Jim Kaufmann. Lapis Lazuli with Australian Opal and Malachite. 27.72 cts. TW. Item #P13: 14Kt. Yellow Gold pendant enhancer with 23x39mm kite Intarsia by Jim Kaufmann. Sugilite with Australian Opal and Malachite. 21.25 cts. TW. Item #V73: 14Kt. Yellow Gold pendant enhancer with 35x38mm triangle Intarsia by Jim Kaufmann. Malachite with Australian Opal, Sugilite, Pristine and Black Jade. 44.38 cts. TW. Item #L25-600: 18Kt. Yellow Gold Pendant Enhancer/Brooch with 32x40mm lozenge Intarsia by Jim Kaufmann. Lapis Lazuli with Malachite and Australian Opal. 36.00 cts. TW. Item #K38-1450: 18Kt. Yellow Gold pendant with 33x51.5mm modified hexagon Intarsia by Jim Kaufmann. Malachite with Australian Opal and Lapis Lazuli. 75.24 cts. TW. Item #GSJ-2663: 18Kt. Yellow Gold Pendant with bezel set 16.2x18.1mm Hexagon Intarsia by Jim Kaufmann. Lapis Lazuli with Australian Opal, Black Jade and Malachite. 8.20 cts. TW.